Since this morning is the Second Sunday of Advent I decided to make church a high priority. 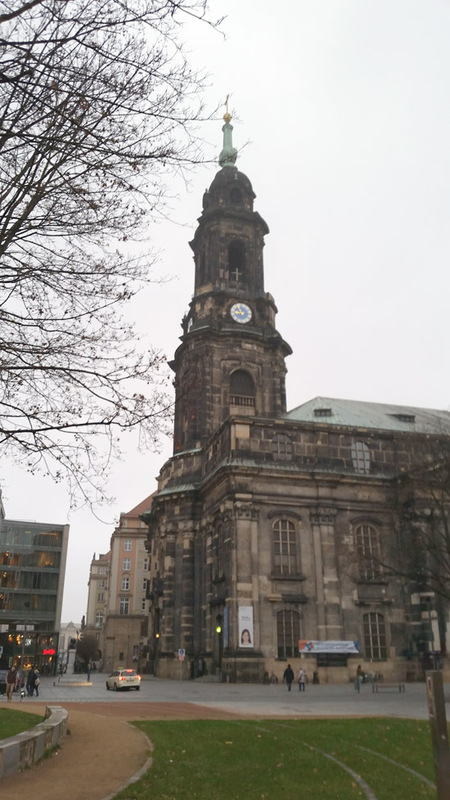 First I went to the Kreuzkirche, the Evangelische, that is the Lutheran Church, for their morning service. The trombones and trumpets performed beautiful advent musical selections from Mendelssohn, Schutz, Eccard, Rutter, Handel, and vigorous congregational singing of traditional Advent hymns from which I derive such joy and spiritual benefit. The organ in Kreuzkirche, Dresden. 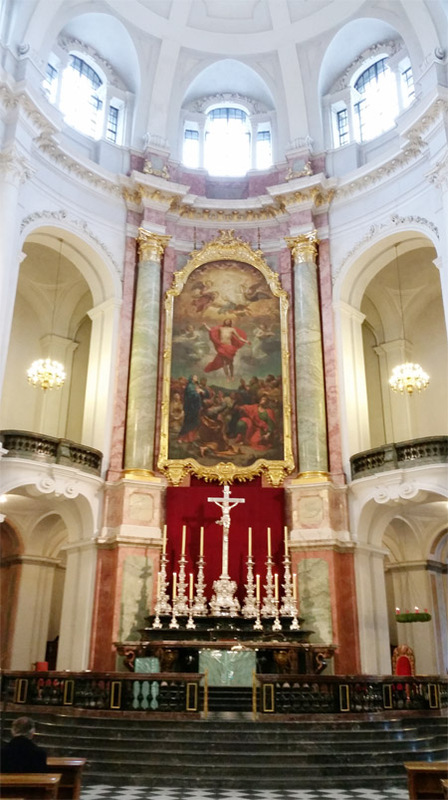 At the conclusion I had a delightful walk to the Hofkirche that is the Catholic cathedral and when I walked in I was overjoyed because it was overflowing and I had to stand, and I was 10 minutes early. Although Mass was in German I felt right at home with the Latin chants. What a wonderful church where you feel at home. 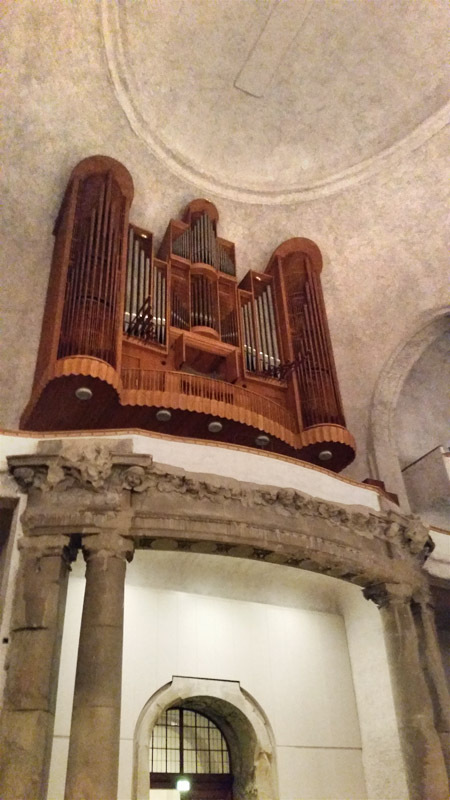 Of course great congregational singing accompanied by the Gottfried Silbermann organ. It was stunning but more stunning was the men-and-boys’ choir. The Dresden bombing of 1945 when 25,000 residents were killed that night was ever present on my mind all through Mass. This church was leveled but reconstructed in all its glory and filled with believers. Hope is what Advent is all about. There was a chapel in the cathedral dedicated to all those innocent men, women and children whose lives went up in flames that night. The memorial is explicit in that it reminds us we can only obtain peace through Christ. And on the wall were the names of 30 priests in the Dresden diocese who suffered because of their resistance to the Nazis. There is also a chapel to a priest of that diocese who has now been beatified. He was murdered on 3 February 1943 by the Nazis and as the pamphlet reminded us, Blessed Alojs Andritzki was with 1000 priests at Dachau. We must not forget the heroic witness of so many Christians. He was beatified and on 14 June 2011 his ashes were transfered to the cathedral in the presence of 11,000 people. What a witness to faith incarnate in the life of a man who resisted evil even to point of giving up his life. Alojs Andritzki, priest and martyr, killed in Dachau in 1943. Beatified in 2011. Wandering around the city was delightful but also pensive in that the night of the carpet bombing was ever present in my mind. How quickly a cultural heritage can go up in flames with the slaughter of innocent lives and yet there is hope as this Sunday proclaims. 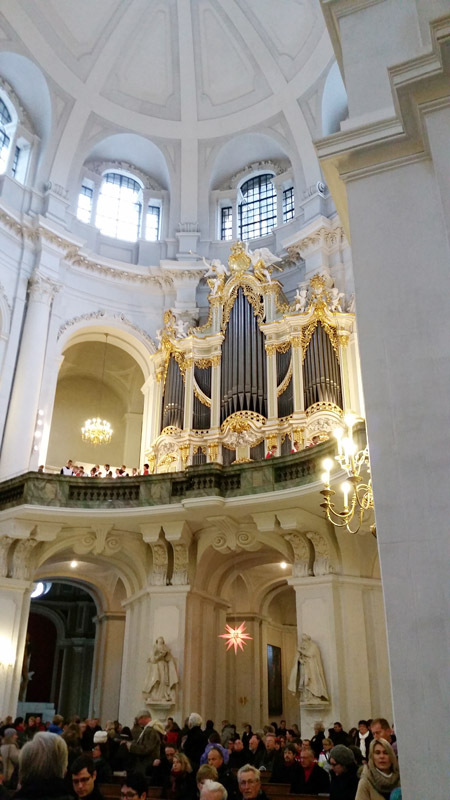 Then back to Kreuzkirche for an organ concert of selections from Bach, Messiaen, and Buxtehude. 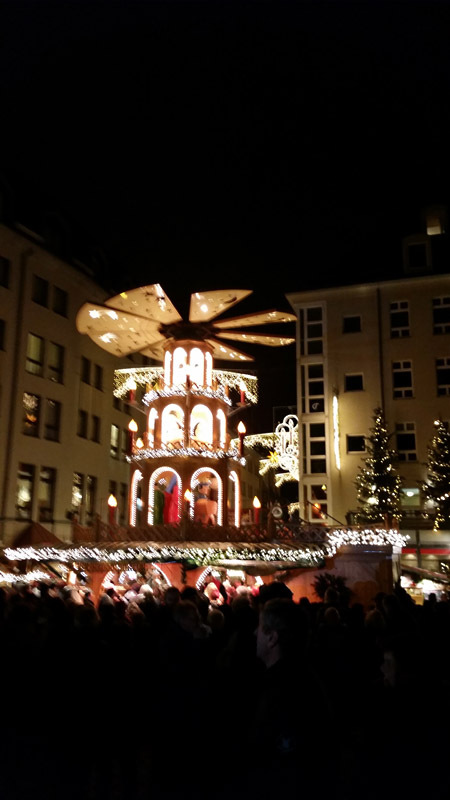 All day I have heard variations on “How Brightly Beams the Morning Star.” After the concert the bells were pealing, the air brisk so I decided to go to evening Mass at the Hofkirche. The church and its fine instrument are attractive however a church full of people singing great Advent hymns is even more appealing. I was not disappointed. Once again a full church with vigorous hymn singing. 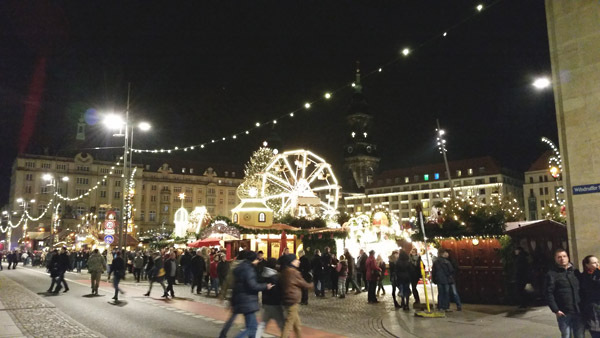 This has been a wonderful second Sunday of Advent in Dresden. 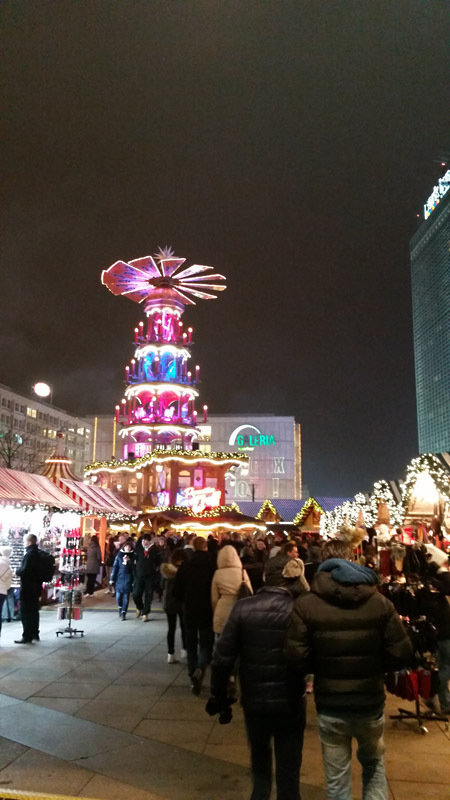 A Christmas market in Dresden. 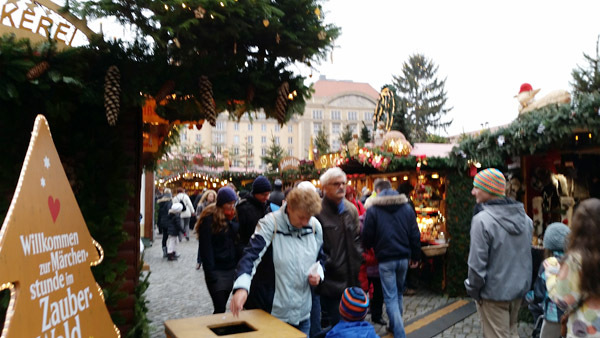 This entry was posted in Europe, Faith, Martyrs and tagged Blessed Alois Andritzki, Christmas Market, Dresden, Europe on December 10, 2014 by frjfkauffmann. 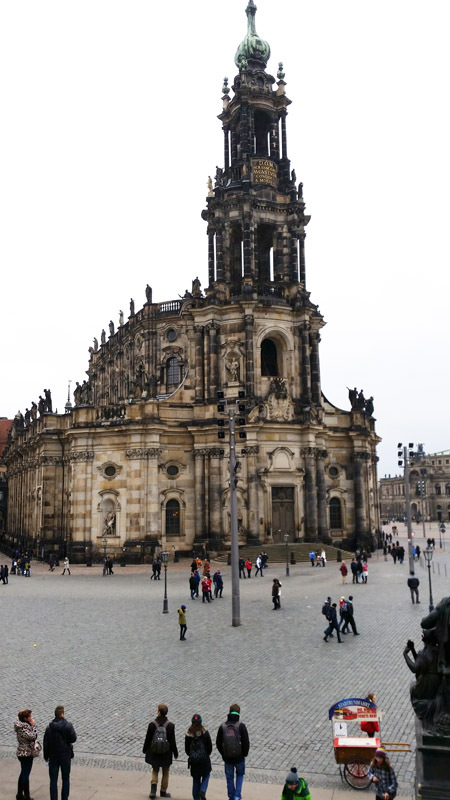 Before departing Berlin for Dresden I took a morning walk to Saint Hedwig, the Catholic cathedral in Berlin. 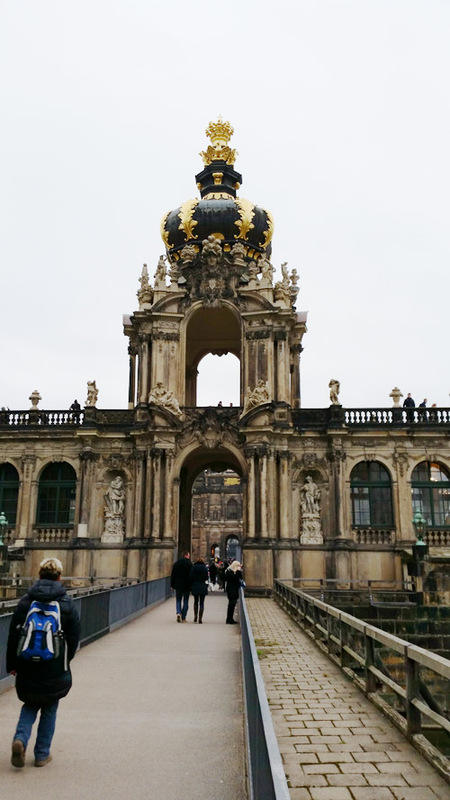 The ride to Dresden was brief so I had a whole day to enjoy the city. 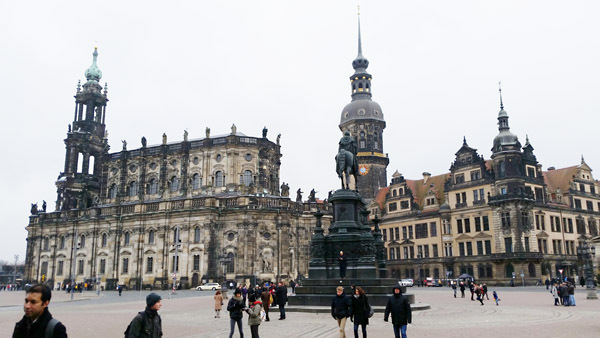 Dresden was noted as one of Germany’s most beautiful cities; however it was completely destroyed when the Americans and British mounted a vast carpet bombing the night of February 13 and 14 in 1945. I had no idea of the devastation except there are photos and it gives me an appreciation of the meticulous renovation that is still in progress, to restore the historical center to its former glory. 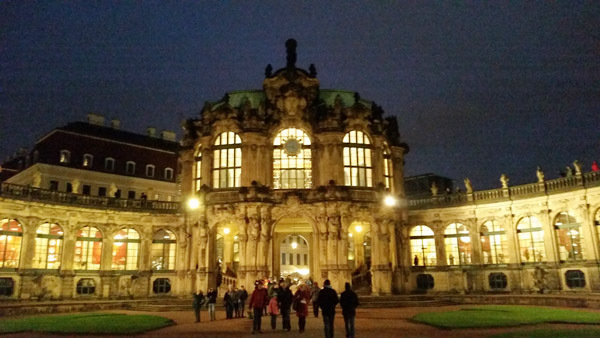 I immediately went to the Zwinger, a beautiful Baroque palace built by August the Strong in 1709 to 1732. The art gallery houses works by Raphael, Dürer, Rembrandt, Van Eyck and Vermeer. I was anxious to see Raphael’s Sistine Madonna which Pope Julius commissioned. 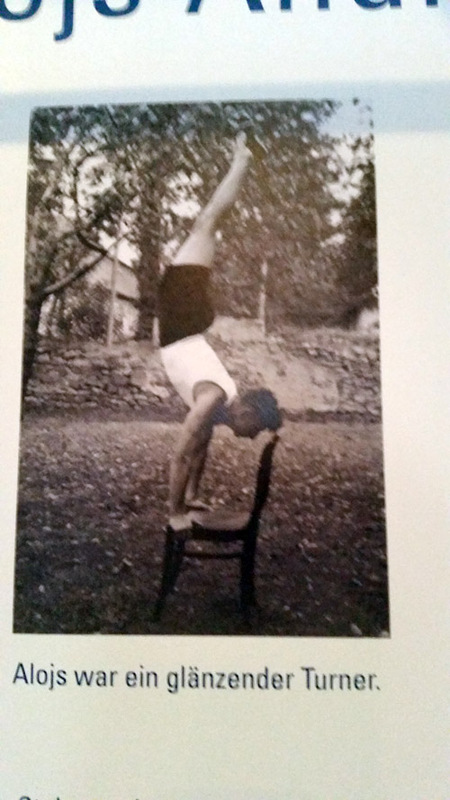 This image was very popular in old missals and much beloved. In the late evening I walked by the Staatsoper which is a landmark of Dresden. 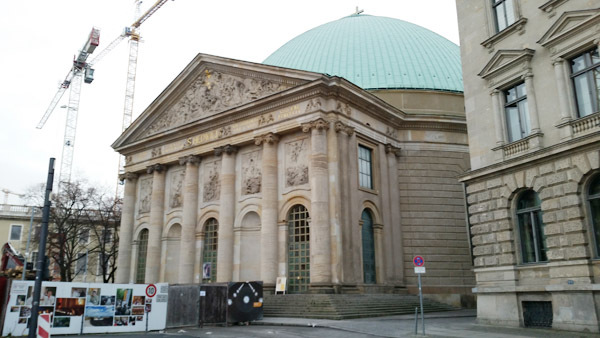 Then to the Hofkirche which is a monumental Baroque Catholic cathedral in Protestant Saxony. 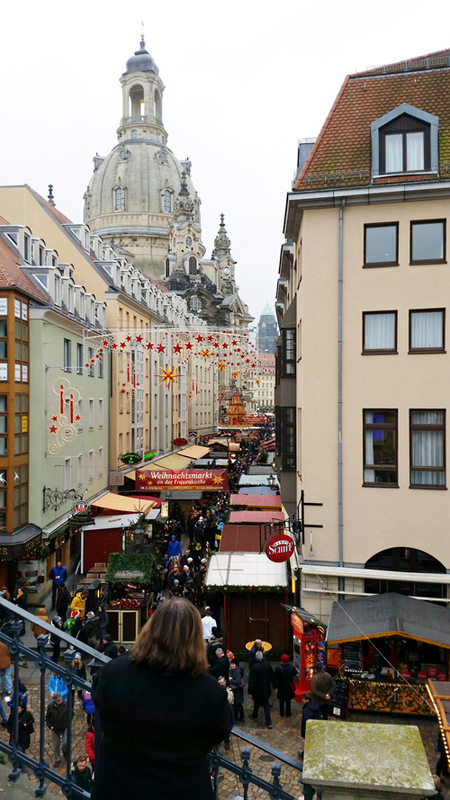 Then to the Frauenkirche with its shining dome. This too was completely destroyed but now reconstructed. 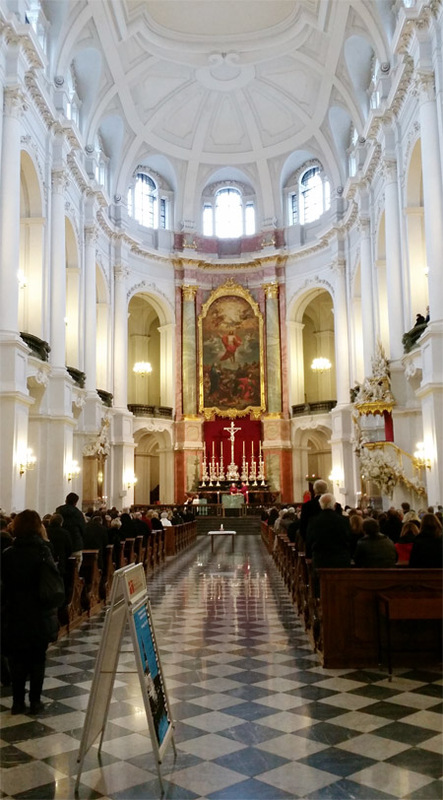 Then to the Kreuzkirche for Advent vespers featuring works of Melchior Franck, Bertali, and Handel performed by the Dresdner Chor der Sächsischen Posaunenmission Bautzner Bläserkreis. The Lutheran minister preached towards the end of the performance followed by congregational singing of the hymn, “Savior of the Nations Come.” It was thrilling to hear 400 hundred people singing. To commemorate its destruction the interior has not been restored as the exterior to its Baroque glory. Everywhere there are memorials reminding one of the destruction but always with the exhortation to peace and reconciliation. 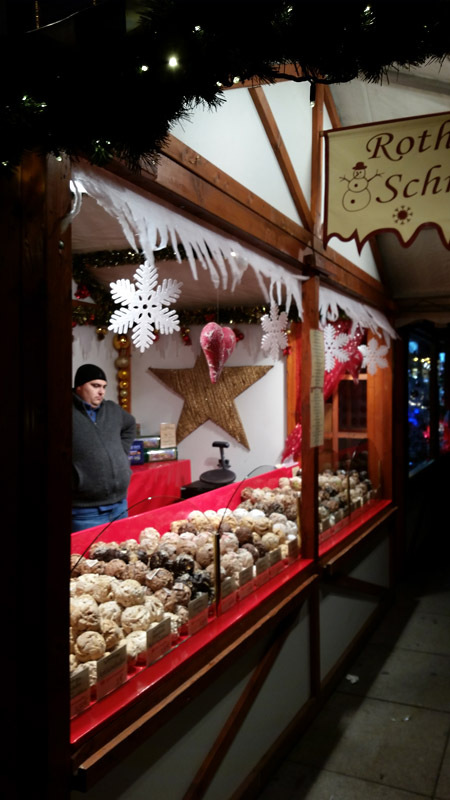 This entry was posted in Europe and tagged Christmas Markets, Dresden, Germany, Saint Hedwig, Zwinger on December 9, 2014 by frjfkauffmann.